May 2, 2014: Another "geocacher" sent me a problem that my Logic Solver program is not solving so far. Several other Geocaching heavy-weights have apparently solved it however. The problem (in German) can be found at http://coord.info/GC3NRMZ. The current Logic Solver update to Version 5.3 has minor updates but the primary reason for the update to get more eyes to look at the problem to see of there are facts and rules in the description which I haven't picked up on or which the program fails to derive. A translation of the problem is included in the download files. We've been busy this month with spring chores (driveway reconditioning, garden preparation, waking up motorized stuff that slept all winter, etc.). 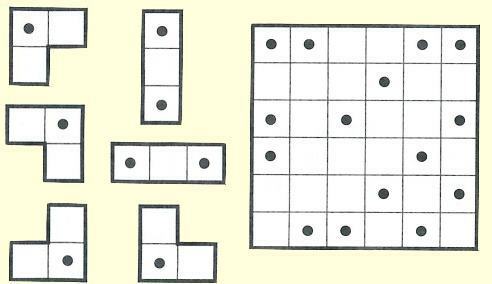 One or more copies of the 6 given shapes have been used to tile the grid and then the outlines were removed. Can you fill them in again? Bug Time Trials Version 2 was posted today after scanning to see what robot related programs I have posted. This is not a very good example but, as usual, playing with it brought a few changes to mind. The "bug" needs to be maneuvered around a "track" and through some gates in your best time. Version 2 allows bug size to be adjusted (smaller bug makes it easier and faster to complete the circuit). I can just break 20 seconds now J. "Alphabet Long Division" is the 40th sample problem added to the our Brute Force solver download since the original posting in 2001. It is the perhaps the first problem to extensively test the shorthand feature that treats character strings in equations as multi-digit integers so we can define this problem with equations like BRINK / RIB = RUN, RIB * R= OAR, etc. Click the here if you have the April program update and just want this new problem to play with.